It is official. Bexar County Sheriff Ralph Lopez has stepped down and resigned his position effective immediately. It was reported earlier here on Walker Report that he was to address his situation in a press conference. Instead, the Sherriff sent Bexar County Judge Nelson Wolff a written letter stating his intent to resign. According to Wolff, the Commissioner's Court will accept the resignation during the Tuesday weekly meeting and set guidelines to fill the unexpired term. 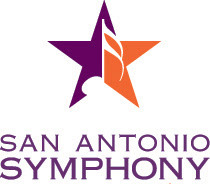 San Antonio (August 31st) - The San Antonio Symphony and the orchestra musicians - the San Antonio Symphony Players Association - concluded a new collective bargaining agreement today. San Antonio Symphony chairman Ken Oleson and Brian Petkovich, chairman of the San Antonio Symphony Players Association, jointly announced the new agreement. The new agreement runs for four years, beginning September 1, 2007, and will increase musician compensation by an average of 4.6 percent each year over that period. The symphony's performance season will be extended to 27 weeks for 2007-08 and will increase one week per season, to a total of 30 weeks, by the end of the agreement. In addition, under the terms of a new electronic media agreement, which is part of the overall contract, any Symphony concert can be broadcast on local radio up to four times, and any four Symphony concerts can be telecast on local television up to four times each. "In partnership with the musicians," Oleson said, "the Symphony can be assured of moving forward with a financially sound and viable future. That has been the spirit of the negotiations, and that overriding viewpoint has enabled us to get the agreement done." "The Orchestra Committee, which led the negotiations for the Symphony Players Association, will unanimously recommend ratification of the agreement to our members," Petkovich said. "I would like to thank Ken Oleson for his steadfast commitment to the symphony over his nine years on the board, and especially throughout his tenure as chairman." "We're looking forward to getting on stage and starting the new season on schedule," he said. "What was going to be a good year is now going to be a great year." Oleson noted, "The symphony will finish the current fiscal year, which ends today, in the black financially - the third year in a row. All ticket sales and donations for the 2007-08 season were set aside in an escrow account so that we will begin the new season with money in the bank, something that very few symphony orchestras across the country can say." "The new electronic media agreement," Petkovich said, "will make the orchestra more accessible to the community. The ability for multiple radio and television broadcasts of concerts can introduce the Symphony to a much wider audience and help us build a new group of future ticket-buyers and patrons." The first Pops concert of the new season - "Bernstein on Broadway" - will be held Sept. 14-15 at 8:00 p.m. in the Majestic Theatre. Renowned violinist Itzhak Perlman will join the Symphony for a special performance Sept. 16, at 7 p.m. in the Majestic Theatre. The first classical concerts for 2007-08 will be held Sept. 28-29, featuring violinist Midori. As I was on my way to the Majestic Theatre to join our Sisters and Brothers with the San Antonio Symphony Players Association on their picket line, when I received great news from Emily Watkins. The AFM Local 23/SASPA and the Symphony Society reached an agreement today! Congratulations to the leadership and their legal council David Van Os. Their contract was to expire at midnight today! Brian and Emily will be getting back to us with their presentation of what they were able to acquire. I want to take this time to say “Thank You” to all of you-this was a moving and special assignment and I enjoyed working with the AFM and the members of the San Antonio Symphony Players Association. And the support that was received from our affiliates of the AFL-CIO was a victory won by ALL! This was a great start to a Labor Day Weekend! May You All enjoy this celebration! 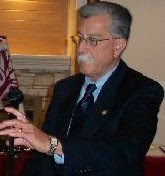 69-year-old Former District 6 Councilman Enrique Barrera, (photo) died early Friday. Barrera suffered from cancer for 12 years. He died with his family near him at 5:32 a.m. in the Vitas Hospice Inpatient Unit at Methodist Healthcare System on Fredericksburg Road. A rosary is slated for Barrera at the Cathedral at 7:30 p.m. Sunday. Mass on Monday will be held at 10 a.m., also at the Cathedral, with burial in San Fernando Cemetery No. 2. A reception will be held afterward at the Cathedral Centre at San Fernando Cathedral. You are invited to our August evening dinner mixer. Live Music at 7 p.m. Event Sponsors: Orderup, The Walker Report and Luxor Insurance Services. 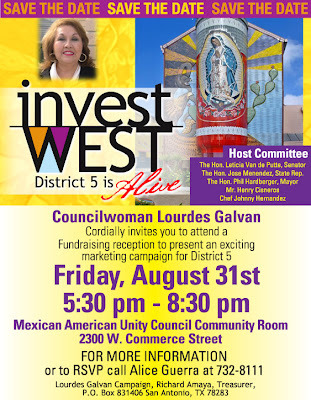 Senator Leticia Van de Putte, Mayor Phil Hardberger, State Rep. Jose Menendez, former Mayor Henry Cisneros and the host committee of Invest West: District 5 is Alive, cordially invite you to a reception in honor of Councilwoman Lourdes Galvan. Date: Friday, August 31st - 5:30 p.m.to 8:30 p.m.
Retire the Debt Contribution: (new cycle) $100. $250. $350. $500. The Councilwoman will be unveiling an exciting marketing campaign for District 5 to bring economic development into her district. Please join her and help by contributing to the work in her district. To RSVP for the sponsor’s board please call Alice Guerra at 732-8111. The eyes of Republicans nationwide will be on Fort Worth, Texas this weekend. Will you be there with us? 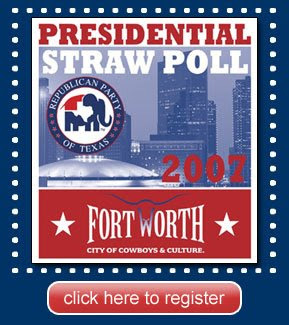 The Texas GOP Presidential Straw Poll promises to be a major milestone in Election 2008. Thousands of grassroots Republicans will converge on Cowtown, August 31st and September 1st for this event, and will vote for their chosen candidate in the first-ever Texas GOP Straw Poll. Hillary, Barack, Nancy and their liberal friends are intent on liberal control after 2008. You can join with the Texas GOP to keep Texas a truly Red State in 2008. Move over, Iowa. Step aside, New Hampshire. The road to the White House starts here in the Lone Star State! I am pleased to announce the Texas Democratic Party is holding our first-ever ePrimary Poll, a weeklong online event that gives Texas Democrats an opportunity to make their voices heard in the next presidential election by supporting their favorite Democratic candidate. Starting today, you can cast a vote for your favorite Democratic presidential candidate at the TDP website. If you want to have a say in determining the next president of the United States, now is the time to make your voice heard! Don't have a favorite candidate yet? Take a few minutes to check out each candidate's profile and their personal message to Texas Democrats by clicking here. Voting for the ePrimary Poll lasts until 11:59 p.m. on Friday, September 7th, and we will announce the winner on September 10th. But if you want to know how your favorite Democrat is doing, check our website for the latest vote tallies, which will be updated daily beginning Tuesday. Cast your vote for the next President of the United States today! Texas has produced some of America's greatest political heroes, and Texas voters have always played a significant role in our nation's politics. The Lone Star State is one of the largest and most populous states in the country - and one of the most diverse. From the woods of East Texas to the Rio Grande Valley, the widespread cultural and geographical differences among Texas voters are a reflection of the diversity of the country as a whole. To win in Texas, a presidential candidate must appeal to urban, suburban and rural voters alike and earn support from Texans of every race, creed, and color. Unfortunately, Republicans in the State Legislature weakened the national political influence of Texas voters when they failed to advance Texas' 2008 primary election date. The ePrimary Poll will give Texas Democrats a chance to weigh in on the presidential nomination process and ensure our voices are heard. Voters are ready for a change, and our Democratic candidates are qualified and ready to lead with new ideas. Make your voice heard and tell the country which Democrat you want to see take back the White House in 2008. Vote NOW! Did you know that Dress for Success San Antonio is part of a worldwide organization and an affiliate to over 80 sister affiliates in four countries? 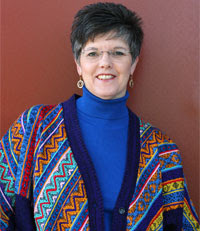 Did you know that Dress for Success San Antonio won the 2006 Professional Women’s Group Affiliate Achievement Award? National Hispanic Professional Organization (NHPO) celebrates Hispanic Heritage Month at Paloma Blanca, 5800 Broadway, September 6th from 6:30 p.m.-9 p.m. For more information email: SAEvent@nhpo.us. Former District 6 Councilman Enrique Barrera passed away, Friday, August 31st. More information to come. Washington (Reuters) - One of the biggest U.S. trade unions made an unusual dual endorsement in the 2008 White House race on Thursday, backing Democrat Hillary Clinton and Republican Mike Huckabee for their parties' presidential nominations. The International Association of Machinists and Aerospace Workers, which has about 720,000 active and retired members, backed a candidate from each party for the first time after a recent survey found about one-third of union members voted Republican and two-thirds Democratic. "The dual endorsement is intended to involve all IAM members in the upcoming election," said IAM International President Tom Buffenbarger. 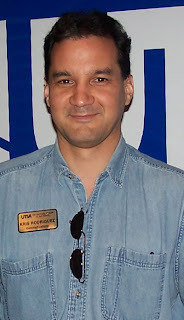 The endorsement was made at the union's national conference in Orlando, Florida. Huckabee, the former governor of Arkansas, was the only Republican to address the labor group. Huckabee has lagged behind the top Republican 2008 contenders in national polls and fund raising but received a boost earlier this month with a surprise second-place finish in the Iowa straw poll. "Mike Huckabee was the only Republican candidate with the guts to meet with our members and the only one willing to figure out where and how we might work together," Buffenbarger said in a statement. The union endorsement was the second of the week for Clinton, a New York senator who leads the Democratic field in national polls 14 months ahead of the November 2008 election. She won the backing of the smaller United Transportation Union on Tuesday. "Hillary Clinton earned the IAM's endorsement by focusing on jobs, health care, education and trade -- the bread and butter issues of the American middle class," Buffenbarger said. Several more unions are expected to make endorsements in the next few weeks after the national AFL-CIO freed its 55 member labor unions to make their own choices. Democratic Sen. Chris Dodd of Connecticut won the endorsement of the International Association of Fire Fighters on Wednesday. Union officials said they would work to educate members about their chosen candidates and publicize their candidacies in union publications and Web sites. Tuesday, September 11th, 6:45-9:15 p.m.
Only $15 for your first meeting! Are you interested in your personal development and living a self-directed life of happiness and contribution? Would acquiring a set of fun, easy, cutting edge life tools be helpful to you? Is expanding your community of people who live consciously important to you? Please consider participating in this unique learning group and discover how to Expand Your Capacity to Give and Receive Love. On September 11th we will explore your relationship with "Appreciation" and the power that it has to transform how you feel about yourself --- and to enhance your relationship with others. Many of Lt. Col. Rick Noriega's (photo of Noriega & sister) supporters have asked how they can show the overwhelming support for his nomination to be our Democratic candidate against Texas' Junior Senator John Cornyn. Today, grassroots activists across Texas are launching a petition to put Rick on the March 2008 Democratic Primary Ballot. The election code gives candidates the option of obtaining signatures or paying $5,000 to qualify a candidate for the ballot. Many candidates opt to just pay the fee because it's the "easy" way to go. We're different. Rick Noriega is building a grassroots campaign, and here's our chance to show the strength of the Noriega grassroots. Texas requires a candidate to obtain 5,000 signatures. We want to blow that number away, so we've set an ambitious goal: 25,000 signatures! Who can sign? Any registered voter in Texas may sign. By signing, you are making an oath not to vote in any other Party primary or convention. The signer doesn't have to have voted Democratic in the past (or even have ever voted before!). The only registered voters who should not sign are those planning on voting in the Republican primary or attending a third party's convention. How many signatures does it take? It takes 5,000 valid ones. To make sure we have enough and to show Rick's overwhelming support, we're going to set a goal of 25,000! What's our deadline? Filing begins on December 4th and ends on January 3, 2008. We'll stop collecting sometime during that period. We've got three months to make a statement. One signature a day and you'll be approaching a hundred! Do people need to know their voter registration number? It helps if they write it in, but we'll look them up. If your local voter registration list is online, you could help by looking them up before you mail them in. Do I hold them or send them in as I go? Please send each page in as you complete a page. The address is on the bottom of each one. How will I know how we're doing? The campaign will periodically send an email to update you and we'll keep a tally on the website. There will be special recognition to those who obtain more than 100 signatures and a really special treat for whomever collects the most! Most campaigns wouldn't even try this, but our campaign is different. Rick's support is deep and wide in Texas, and here's our chance to prove it. Not only are you helping to get Rick on the ballot, you'll also be spreading his message across Texas. That's something a $5,000 check to the Texas Elections Division can't buy. Let's show Rick how many supporters we have out there by hitting this goal long before the deadline. Take it to work, to school, or to church. Go to your Labor Day weekend picnics and get signatures. Pass it around at any Democratic meetings or events. Let's reach our 25,000 signature goal! It’s not just citizens who are fed-up with the Texas Department of Transportation (TxDOT), so are lawmakers. TxDOT has crossed the line on a number of fronts in recent weeks, and elected representatives are prepared to fight. TxDOT repeatedly claimed it wouldn’t toll existing roads then lobbies Congress to do just that. (http://texasturf.org/index.php? Read TURF’s formal complaint against TxDOT’s illegal use of taxpayer money filed with Travis County District Attorney Ronnie Earle here: http://texasturf.org/index.php? When: Tuesday, September 4th, at 2 p.m.
Where: Condemned gas station/Tetco store at southwest corner of US 281 & Stone Oak Pkwy. 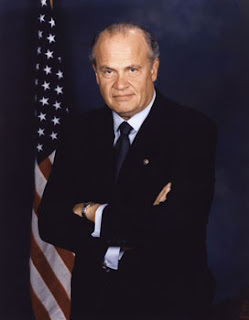 Des Moines, Iowa -- Republican Fred Thompson, (Photo) whose entry into the presidential race has been long anticipated, will officially launch his candidacy Sept. 6 in a webcast on his campaign site, followed by a five-day tour of early primary states, the Associated Press has learned. Dress for Success CEO Pamela Taylor is a finalist of the prestigious ATHENA Award® to be presented Wednesday, September 19th, at the Marriott Rivercenter Hotel, noon to 1:30 p.m. The award recipient will be announced at the luncheon at noon. Our "Dollars for Dreamers" Fundraiser, Silent and Dinner to benefit the "I Have a Dream Foundation went extremely well! The event helped us raise over $10,000 to go towards the adoption of a new class of 3rd grade students! Thank you all for coming to help make a difference in a Dreamers life. See you at our next fundraiser! 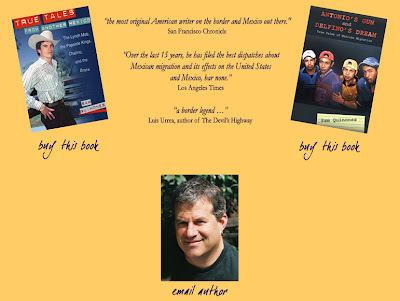 Los Angeles Times reporter Sam Quinones' new book on Mexican immigration, Antonio's Gun and Delfino's Dream, has been lauded in the San Francisco Chronicle, Los Angeles Times, Publishers Weekly, and Library Journal and Quinones has been interviewed on All Things Considered, CSPAN, and News Hour with Jim Lehrer. Quinones will be in San Antonio Wednesday, September 19, 5 p.m. at The Twig Bookshop at 5005 Broadway. Quinones will talk about his book and sign copies. Antonio's Gun and Delfino's Dream is a series of vignettes on Mexican immigration, covering the opera scene in Tijuana, meatpacking and soccer in Kansas, velvet painting in El Paso, and other fascinating topics. Quinones is available for interviews, and can accommodate Spanish-language media. Please contact Amanda Sutton for more details: 505-272-7190 or asutton@unm.edu. More information about Quinones' work can be found at http://www.samquinones.com/. Here’s a link to our UTSA Today story on some exciting news that took place last week at The University of Texas at San Antonio. 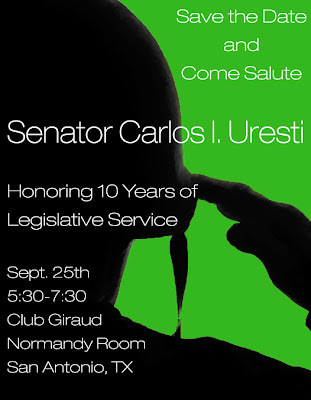 Come salute State Senator Carlos Uresti, honoring 10 years of legislative service. 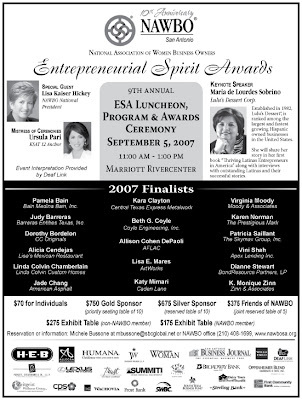 National Association of Women Business Owners celebrate its 10th Anniversary by hosting the 9th Annual ESA Luncheon Program & Awards Ceremony, September 5th, from 11 a.m.-1 p.m. at the Marriott River Center. Latino Breakfast Club drew a good early morning crowd to Cha Cha's on Babcock Road, Wednesday, August 29th. Invest West, District 5 is Alive! Goodbye Nacho Guarache, we will miss you!